February has been a big month for me. 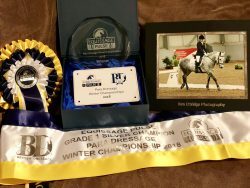 I didn’t manage a blog in January because I spent quite a lot of time in hospital with various problems (the downside of being a Para rider!) Fortunately, I managed to be out when it counted. I came out of hospital, had two outings to qualifiers and a biometrics clinic in 6 days, qualified for the championships with scores of 70.25% and 71.25% in the Novice test and 72.5% in the team test (which is a bit like advanced medium) and then went back into hospital again. February was all about preparing for the National Silver Para Championships. I did a lot of hacking to keep Tiger fit and get her stepping out in her walk. My coach Claire from So Very Sport Horses worked with me, mostly in the snow, to improve Tiger’s suppleness, her halts and the test in general. Early on in February I also had a very exciting day, organised by the Award In Sporting Excellence course, visiting Carl Hester’s yard. We were given a lecture demo by Carl Hester, saw some of the young horses being trained and watched Charlotte Dujardin school Hawtins Delicato. I had the chance to meet Valegro and Uthopia too! Tiger had a health check and a massage in the middle of the month from Laura Clinton from Equiflexion, just to make sure that she was working straight and had no part of her that was uncomfortable. Laura used Tiger’s favourite Horslyx mini to help her to do her stretches and check that she was supple. Laura was impressed with how straight and healthy Tiger is. I know that her Horslyx balancer is really keeping her healthy and giving her the nutritional support she needs. Tiger and I had a 2 day stay at Hartpury College for the Award In Sporting Excellence Course. It was a full-on couple of days, doing test riding with Tiger as well as lots of coursework. Tiger was very good. She was completely calm about her two days away. All of this was very good preparation for the Para Winter Championships which were held on the 17th & 18th February at Myerscough. The first day of the Championships was a warm up day, with an opportunity to settle Tiger into the arena but also earn points towards the Summer Championships. Claire rode Tiger in for me. Competitors from Grades 1 to 3 are allowed someone to ride the horse in for 30 minutes per day as long as the competitor is on the horse for at least 15 minutes before the test starts. I usually like to be on Tiger at least 20 minutes before the start of the test. I was delighted with how responsive Tiger was to me and very pleased with my results; 70.5% and a 1st place. This also gives me 6 points towards the 12 I need for the Summer Championship. On the Championship day, Tiger worked in particularly well especially in a warm up where a couple of the other horses were quite unsettled. Tiger got on with her job and focused on me. It showed in the test because we got 70.38% and won the Grade 1 National Silver Championship! I am so proud of my pony and love her so much! When I got back from the Championships I had a very exciting delivery from Horslyx, with Tiger’s Horslyx and a beautiful fleece for her to wear to competitions. She is a very spoilt pony. Thank you very much Horslyx for your part in Tiger’s win, keeping her in the best health and condition so that she can perform her best!